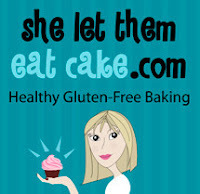 Today I would like to introduce you to one of my March sponsors Maggie Savage of She Let Them Eat Cake. My husband was diagnosed with Celiac Disease about 8 years ago and I’ve been baking gluten-free since. We’re very thankful for his diagnosis as it has changed our lives for the better, in so many ways. In December of 2009, our then 3 year old son, Callum, was diagnosed with gluten, dairy, and egg intolerances. That was shocking. This news was a little easier because we were already a gluten-free friendly family. In addition, we had already eliminated dairy in 2008 so we could get him off inhalers. It was this change that led us to become an entirely gluten-free family. No gluten in our house. It might sound crazy, but we find it easier that way. And we all feel better. The impact our children have on our journeys always amazes me. In the past couple of years we have discovered real food and the power that comes with eating real food. We’ve never felt better. Our diet consists of mostly fruits and vegetables, nuts and seeds, legumes, and lots of smoothies. Smoothies are a food group, right? In my free-time I blog at She Let Them Eat Cake and I’m the co-founder of The Balanced Platter. I’m also studying to become a Registered Holistic Nutritionist. I started blogging in August of 2010 at the urging of my husband. He thought I needed a place to share my gluten-free experiences, recipes, and musings. I’m so glad I listened to him! You are a mama to two, wife, nutrition student, co-owner of the Balance Platter, gluten free recipe goddess and more, how do you manage to balance it all and still find time for yourself? I have made a conscious decision to fill my plate with only the things I love doing. My studies, my baking, and my blogging are my time to myself and I love it that way. I also spend 5 days a week running which keeps me balanced and happy. You are well known in the gluten free social media community, how important is this community to you? How has being a part of this community helped you? Community is so important to me and I feel blessed to live and blog in a great community. My husband and I live in a small town and we love it. The gluten-free blogging community is so supportive; it’s incredible. Twitter and Facebook are important to me because they allow me to connect with so many people. I’ve made a lot of good friends through social media, and I’m grateful for that. You have a free day, no plans, how do you spend it? An amazing run; preferably with my husband. Some park-time with the family (including our 8 year old dog). A delicious and nutritious dinner with my husband while we’re watching a movie. Would you like to share a recipe with us? 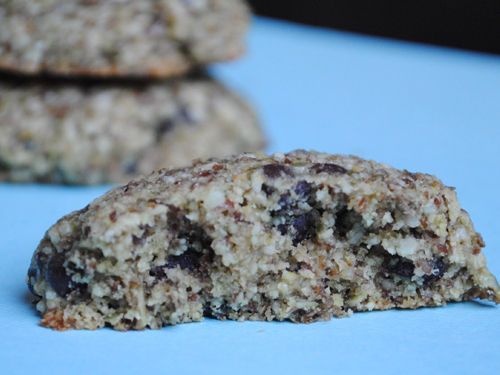 I’ve recently started playing with pumpkin seed flour so I’ll share a cookie recipe with you. It’s so nutritious and pairs perfectly with local maple syrup. In a smaller bowl mix vanilla, maple syrup, and psyllium husks. Let sit for a few minutes as it thickens. Stir in melted coconut oil (I melt mine in a oven-safe glass dish while the oven is preheating). 2. If you don’t have sensitivity to oats, you can use gluten-free oat flour instead of ground quinoa flakes. Thanks so much for taking the time to share a little bit about yourself with us. It was wonderful getting to know you a little better Maggie. i can't wait to make a batch of those cookies!!! yum!! Thanks for sharing me Kim! Thanks so much for adding someone wonderful to my list of great blogs/resources!